Cilymol Abraham is a certified nurse practitioner for the Department of Family and Community Medicine at McGovern Medical School at The University of Texas Health Science Center at Houston (UTHealth) with more than 16 years of experience in pediatric primary care and a doctorate in nursing. Ms. Abraham sees patients from birth to 18. She is passionate on providing individualized attention to patients and is committed to understanding and listening to their needs. Her clinical interests are centered on the management of childhood obesity and the management of asthma. 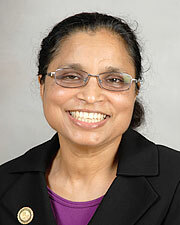 In 2012, Ms. Abraham was honored by the UTHealth School of Nursing Faculty Award of Excellence for Academic Achievement. She is also an active member of the National Association of Pediatric Nurse Practitioners. In her spare time, Ms. Abraham enjoys traveling, cooking, reading, gardening and hiking.